Midfielder's welcome return just in time for MLS playoffs. Trent Nelson | The Salt Lake Tribune Real Salt Lake's Javier Morales falls with a horrific injury on last Saturday during a match against Chivas USA at Rio Tinto Stadium in Sandy. Chris Detrick | The Salt Lake Tribune Real Salt Lake's Javier Morales, who sat out most of the season with an ankle injury, is close to peak form as the Major League Soccer playoffs approach. Trent Nelson | The Salt Lake Tribune Real Salt Lake's Javier Morales falls with a horrific injury, with Chivas USA's Marcos Mondaini defending. Real Salt Lake vs. Chivas USA, MLS Soccer at Rio Tinto Stadium in Sandy, Utah, Saturday, May 7, 2011. The moment was a long time coming. An audible buzz of delicious anticipation swirled through the 20,000 spectators jammed into Rio Tinto Stadium. And when the moment came, it did not matter one bit that Real Salt Lake trailed 2-0. After nearly five months  143 days to be exact  Javier Morales was on the sideline, flexing his leg muscles with little toe leaps. Morales' entrance was greeted with a shattering roar. Then, on his first touch, a free kick, the RSL midfielder came tantalizingly close to beating the Chicago Fire goalkeeper. But that would have happened only in Hollywood. "Of course, a movie," Morales said with a laugh. "One hundred percent." 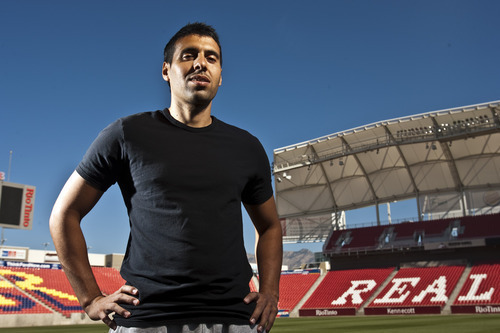 Since his debut for RSL on Aug. 28, 2007, Morales has become a fan favorite through hard work and spectacular play. Morales' first corner kick for RSL produced a goal. It was also the quickest assist in Major League Soccer history, coming 40 seconds into a game against Kansas City. But even Morales could not anticipate the reception he'd receive Sept. 28, the first game back following a horrific left ankle dislocation and fracture from a sliding tackle May 7 against Chivas USA. "I expected something, but nothing like that," said the 31-year-old Argentine midfielder. "Unbelievable. It was one of the best feelings of my soccer life. I have a story to tell my grandchildren, one day the people of Salt Lake were amazing for me." Morales' return to the RSL lineup could not have come at a better time. Since the veteran's injury  "I saw it once, it was enough"  Real's season has been one of uncertainty, dominated by losing streaks that sandwiched one improbable string of five consecutive victories. But he has reclaimed his spot in the lineup just in time for the start of the Major League playoffs. RSL clinched a playoff berth last month. With a victory Saturday or a Dallas loss, Real can nail down third place in the MLS Western Conference. Morales' teammates are more than a little happy to have him back at close to full steam. "He can make plays out of nowhere," RSL midfielder Ned Grabavoy said. Morales has played three games since returning to the RSL lineup, and he is just now returning to something close to peak form. Against Colorado on Oct. 14, Morales began playing his characteristic all-around game, chasing on defense and tackling. The passing never went away. "The biggest thing I appreciate from him, you can play him the ball at any time, no matter what ... and he can absorb these passes and turn it into a good pass," RSL midfielder Kyle Beckerman said. "When you have a player like that, it makes everybody's job easier." The duo of Beckerman and Morales has been the one constant during the RSL improvement since 2007, leading eventually to a MLS Cup trophy in 2009. "Kyle and me speak a different language outside the field," Morales said. "On the field we speak the same soccer. I think like him." RSL coach Jason Kreis said the two share an innate understanding. That type of play has also been lacking since Morales' injury. The pairing, however, was delayed by a Beckerman red card Sept. 28 that led to a three-game suspension. "I told him I was mad because I waited a long time to play with him," Morales said. "But those things happen." From the start, Morales' attitude about soccer was what sold Kreis  whose philosophy has always been no stars, team first. "I had a real good feeling about him from going down to Argentina and having a lunch with him," Kreis said. "I had very good positive feelings about what I'd seen on video, but to actually sit down and look somebody in the eye and get a feeling for why exactly you want to come to MLS and what it will mean to you and what kind of person you are, those kinds of things, again, oftentimes are more important that what you can do with a ball." Morales has always been good on the ball. In his second season, Morales started 29 of Real Salt Lake's 30 games, scoring six goals with 15 assists, shattering the club record of 11 set by Jeff Cunningham in 2006. It was also the second-highest total in the MLS that season. Morales began the 2010 season with two goals and an assist at San Jose. And nearly didn't happen. Had Kreis been a day or two later, Morales would have signed with Talamanca of Spain. The contract and money had already been agreed to before RSL made its offer. "I wasn't sure," Morales said. "But after talking with Jason, he told me about the stadium, how the city would be a perfect fit for my family. Jason always says he doesn't want a star. ... I agree with that. Soccer is about the group, a team." It is that selfless attitude that has made the 5-foot-9, 143-pound Morales a favorite with RSL fans. It is why they greeted him with so much warmth that chilly September night. "I feel better every game," he said. "I keep improving, keep giving my best. I'm not 100 percent but pretty close." RSL will take it, just in time for the MLS playoffs. Notes • Between 1998 to 2006, Morales played for four different teams in the Primera Division Argentina. ... Morales signed with Real Salt Lake in 2007. ... His first assist for RSL, 40 seconds into his MLS debut on Aug. 29, was the fastest first assist in MLS history. ... Morales has scored 17 goals in 97 appearances for RSL. About RSL • A victory would give Salt Lake third place in the Western Conference. ... A win Saturday would give RSL the highest home winning percentage over any four-season span. RSL and Columbus would have 39 wins from 2008-11, but RSL would end the 62-game run with only five losses. Columbus has 10. ... The first 5,000 fans Saturday receive a Nick Rimando bobblehead doll. About the Timbers • Portland was eliminated from the playoffs following a victory Thursday by New York. ... Kenny Cooper leads Portland with eight goals.